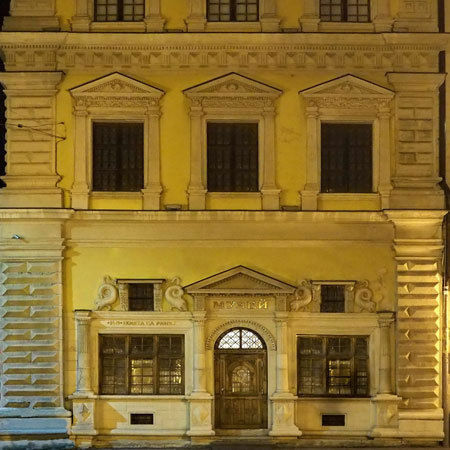 Palazzo Bandinelli is a monument of Renaissance architecture in Lviv of the late 16th – 17th centuries. The architect is unknown. The name comes from the surname of the house owner of the second quarter of the 17th century, Roberto Bandinelli. The monument is located at the corner of the east side of Rynok Square and Stavropigiyska Street (Rynok Sq., 2).The house has two floors and an inner courtyard. The main façade, facing the square, is narrow, with three windows horizontally, that is typical for buildings of Lviv suburbs of 16th – 17th centuries. The Palace attracts attention with its rich architectural decor, which gives it a special elegance and similarity with Renaissance palazzi of rich citizens of Italian cities. The facade is lavishly decorated with white-stone carvings: rosettes, mascarons, heads of little angels. The portal columns retained a carved scale-like pattern. Embossed images of resiliently bent dolphins attract attention.This known Christian symbol of faith and salvation was a very popular motif in art in 16th – 17th centuries.In general, the house retained the planning structure and partially – the interior of the 17th century. Authentic carved ceiling beams, white-stone pillars between the windows, encrusted with alabaster, have been preserved on the first floor in the front hall. The building has undergone numerous alterations in 18th – 19th centuries. It obtained its modern look after a thorough restoration carried out in 2000 – 2007.Many important and interesting events in the history of our city are associated with the names of owners and residents of Palazzo Bandinelli. Here lived in the early 17th century the author of the famous historical write-up of the city, printed in the six-volume "Descriptions of Prominent Cities of the World" (Cologne, 1617) – Johann Alnpeck. In 1629 the owner of the buildings Roberto Bandinelli opened the first regular post office in Lviv. In the 19th century there was a bookshop and Wildes’ book publishing firm.Since 2005, the building houses Lviv Historical Museum.